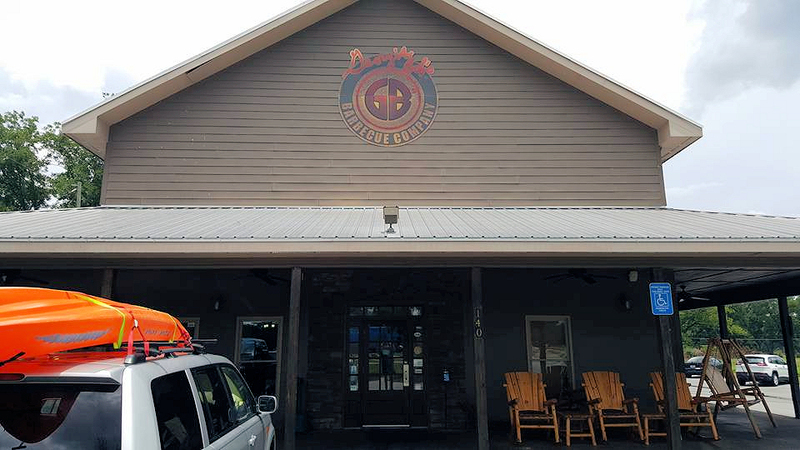 The entrance to Georgia Bob’s Barbecue Company. There is ample parking and rocking chairs to relax. Photo by Doug Deal. Today, my husband and I got the opportunity to try Georgia Bob’s BBQ in Byron. We’ve been going out to eat a fair amount lately, and have had a craving for barbecue. We’ve not had a chance to try Georgia Bob’s, but since we were in the neighborhood for a kids birthday part at Party Playground, we stopped by for lunch. The atmosphere was laid-back country comfort but with large-screen tvs playing a variety of sports competitions. Several rooms give patrons the opportunity to sit away from the television for good ol’ family time, but free Wi-Fi was available everywhere. Georgia Bob’s chicken salad with sweet potato tots and Brunswick stew. Photo by Doug Deal. 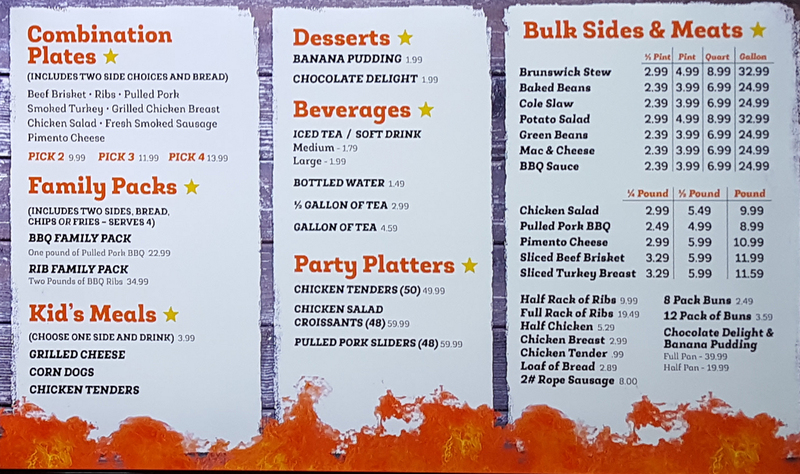 The menu has a lot of variety beyond your standard barbecue fare, including sandwiches, burgers, and a number of different salads. 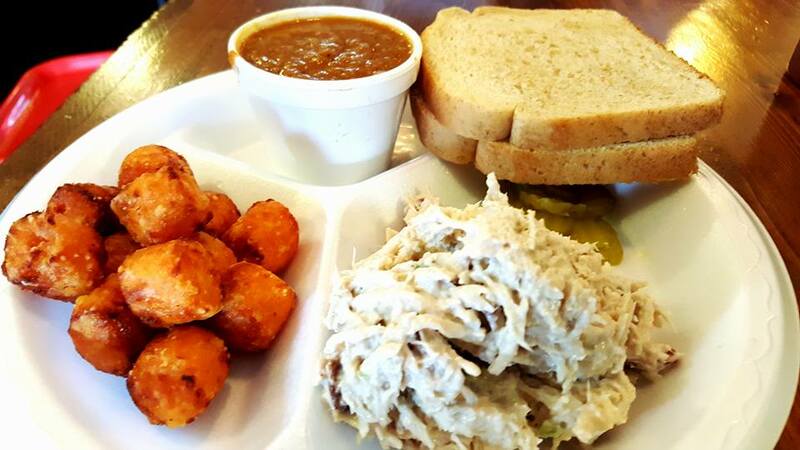 I tried the chicken salad sandwich plate, with a cup of Brunswick stew and sweet potato tots. The meat portion was generous, as were the side portions. Chicken salad is highly subject to personal taste, and I truly enjoyed Georgia Bob’s combination. Georgia Bob’s pulled port plate with enough meat for a good sized sandwich and leftovers to eat plain. Photo by Doug Deal. The meat takes center stage, with a conservative amount of mayonnaise and other ingredients. There are nuts mixed in, which I am guessing are pecans but could have been walnuts. The sweet potato tots were a fun, new taste for me, and a nice alternative to french fries or potato salad. 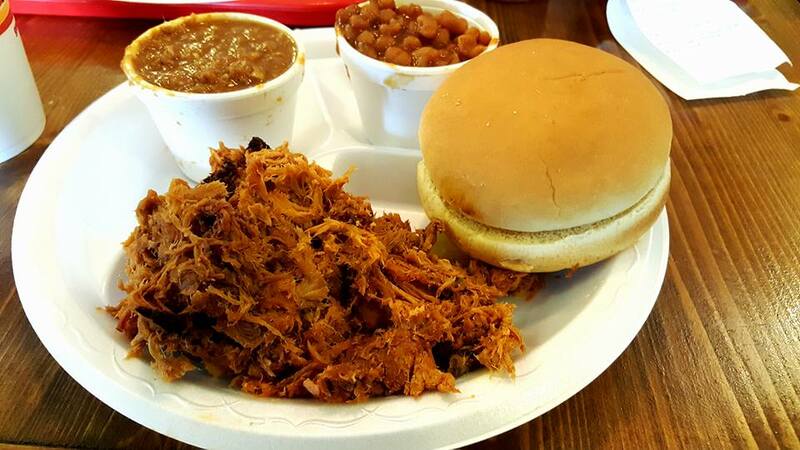 My husband chose a barbecue sandwich plate, which he paired with baked beans and Brunswick stew. There were three sauces on the table: mild, sweet, and saucy, and all three were delicious. After making a sandwich, he had ample meat leftover. The barbecue had a smoky flavor, but not overly so. 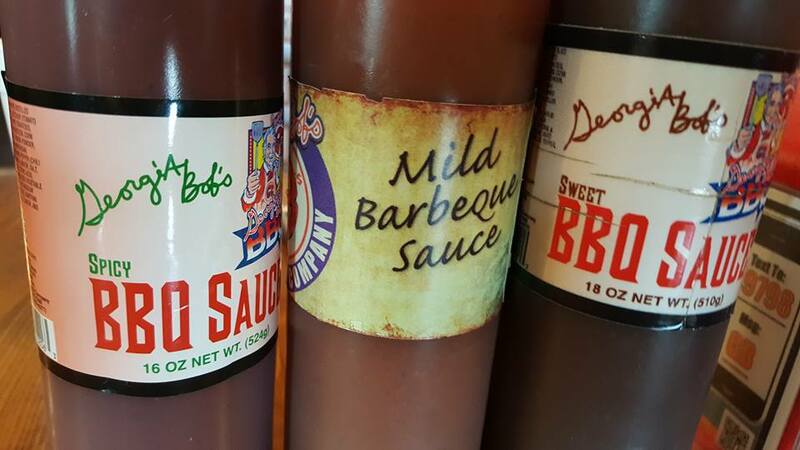 Georgia Bob’s offers three choices for sauces, hot, mild and sweet. All are delicious and there is also Tabasco on the table. Photo by Doug Deal. The beans were hearty and flavorful, and the Brunswick stew was well-balanced. Both complimented the barbecue nicely. Georgia Bob’s BBQ was a good dining experience, and a nice place to relax and enjoy a meal. They also offer family packs, party packs, and tailgating platters; seasonally, they have holiday packs, such as ham dinners at Christmas time. 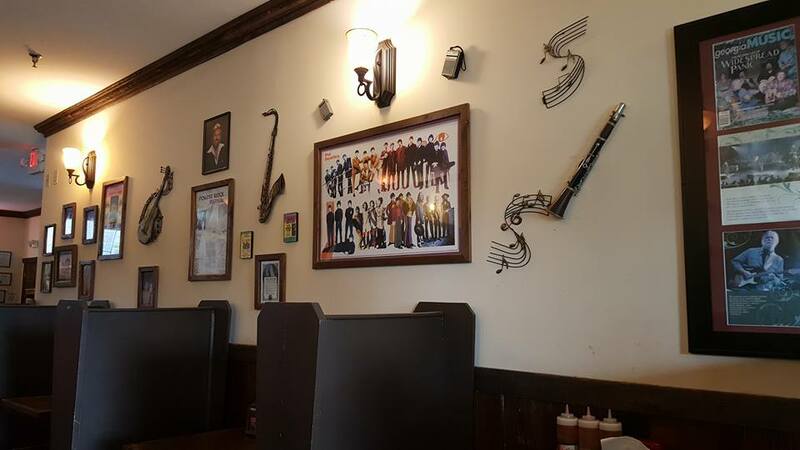 Georgia Bob’s interior is a country music/rock theme. Photo by Doug Deal. 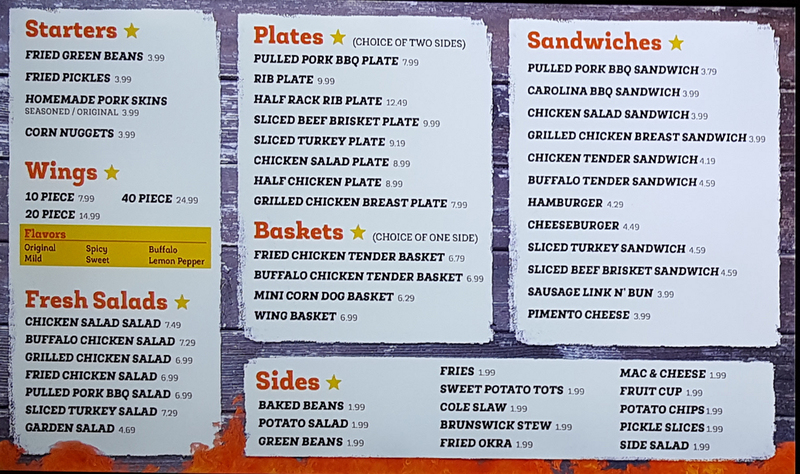 Part 1 of Georgia Bob’s Menu. Photo by Doug Deal. Part 2 of Georgia Bob’s Menu. Photo by Doug Deal.